Essential oils have come a very long way since your grandma used them, and some are very effective for getting rid of fleas. This article will help you to identify what should be avoided (some oils are dangerous for your pets), which ones are highly effective and a step by step guide on using them to sort out all your flea problems. What essential oils are completely safe to use on your kitty cats? Are there types of these oils that are 100% safe for my dog? Will essential oils keep fleas away and how long do they last? Can any of these natural oils help me kill fleas in my home? Are these essential oils effective for fleas in my outdoor areas? Do essential oils really work for flea control? The tiny flea is a surprisingly resilient creature! The female can reproduce prolifically, laying about 2000 eggs in her lifetime. The life cycle of the flea can last up to 6 months. This cycle needs to be broken to make sure that you have got rid of them, eggs and all. Add to this; they have the mind-boggling ability to jump up to 150 times their length, that would be an average of between 5.1 and 7.8 inches (a human would have to jump about 328 yards to comparatively match that). With this Olympic worthy ability, this creature can transition easily from the grass, onto your darling pet and finally into your beautiful, well-kept home. So, can essential oils help with these horrible pests? Armed with some of the oils mentioned in this article, the answer is YES. There are some oils that, if used correctly and regularly, will go a long way in keeping fleas well away from your pet. Many oils contain anti-inflammatory, antiseptic, anti-parasitic and analgesic properties, so they are a fantastic choice for effectively dealing with fleas. PRO TIP: It is important to try and use a high quality oil (therapeutic or organic oil is best), especially if you are thinking of applying it on your pets as shown in this article. Although the alternative may still kill or keep fleas away, it may not work as well, and you also want to avoid any potential undesirable additives (or just lack of strength) sometimes found in a low quality oil. However, even natural solutions need to be used responsibly, and some safety guidelines need to be followed. For example, you should always to use these oils in a diluted form, never on pets younger than 10 weeks, should never be eaten and must be avoided if your furry friend is sick or pregnant. They are incredibly potent, and the last thing you want is to harm your pet while trying to eliminate their fleas. What essential oils are safe for fleas on cats? We need to take great care when using essential oils around our cats, as they can be extremely dangerous to their health and overall well-being. Unlike dogs, cats have only a small amount of the liver enzyme glucuronyl transferase, and this makes it difficult for them to process phenols (otherwise known as carbolic acid). Although this is not present in ALL of of these oils, it is found in many of them so please be careful. Let’s look at some options that would be safe to use on and around our feline friends. I will focus on oils that are widely available (in most parts of the world). Please remember to use all of the oils mentioned must in a diluted form. Cedarwood oil: This is one oil that will kill fleas on contact. The oil is extracted via steam distillation and is usually made without phenols, making it safe to use around cats. Mix 2 drops of it with 2 tablespoons of coconut oil, and massage into your kitty’s fur, paying special attention to their armpits, neck and lower back (fleas love these areas). Lavender oil: Lavender oil does contain a chemical called linalool. Although toxic to cats when ingested (never allow this), it can be used when it is diluted with a carrier like coconut oil. Mix 2 drops of lavender oil to 1 cup of carrier oil to make an excellent flea repellent solution. Fleas detest the smell of lavender and will stay well away from any kitty cat that has it on. Neem oil: Neem oil is well tolerated by cats. I like to add one teaspoon of this oil to a cup of cat shampoo. Although you may think otherwise, many cats don’t mind a bath, and Neem oil can keeping both fleas and ticks away from your fur baby. If you do have a cat that would object strongly to a bath, use a tiny drop of this oil on the outside of your cat’s collar to repel fleas. Rosemary: Rosemary is a great natural flea control product that can be safely used on cats. Dilute two drops of rosemary oil in 1 cup of water in a small spray bottle. Shake well so that the oil is well blended and use this to spray lightly over your cat’s body, carefully avoiding his face. Alternatively, put 2 drops of this oil in 33 oz (1L) of lukewarm water and pour it on your kitty. Coconut oil:This is my number one go-to oil when I declare war against fleas and it is extremely effective. Although it kills fleas almost instantly, it is entirely harmless when used on cats and can be used in so many creative ways to get rid of fleas on your cats (or dogs). Please read my article on using coconut oil to kill fleas for an in-depth look at this oil and how to use it properly. What essential oils can be safely used for fleas on dogs? Fortunately, when it comes to using essential oils for fleas, dogs are not as sensitive as cats (in terms of their liver), and as such, many different oils can be safely used on and around our big furry friends to help fight off fleas. With this in mind, feel free to use any of the oils mentioned under the cat section as they are entirely safe (especially the coconut oil option, which is one of my favorites). There are, however, a few other options for dogs that are especially effective, let’s dive right in. Peppermint oil: Peppermint is an oil you can use safely around canines that your feline will not tolerate. It can be used in a diluted spray, used neat on a bandana or collar and diffused in the house. 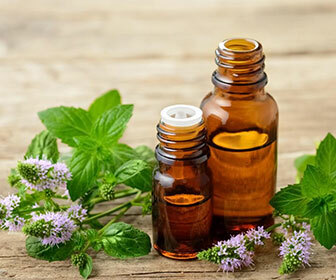 Please read my article on using peppermint oil for fleas to see how to use it on your dog. Eucalyptus oil: Eucalyptus oil is another easily available oil that does a great job of getting rid of fleas. To use it, put 20 drops of oil in a spray bottle with 2 cups of water, and spray your doggie’s coat. If you don’t have a spray bottle handy, just mix the same amount of oil in lukewarm water and simply pour it slowly over your dog, rubbing in with your hands to get his coat saturated. Adjust the quantities according to the size of your pet. Lemongrass oil: Firstly, fleas hate the smell of lemongrass. Secondly, it contains citral and geraniol which is a natural flea and parasite repellent. Lemongrass can also be made into your homemade flea spray by mixing five drops per cup of water and carefully spraying your dog’s coat, making sure you get under his armpits, top of tail and back of the neck. Personally, I absolutely love the smell of this oil, so I always put it in the mixture when making a flea spray for my doggy friend. Rose Geranium oil: The benefit of using rose geranium oil is that it is anti-fungal as well as being useful in repelling fleas and ticks. It is one of the oils that can be used neat but of course in small amounts. Place just one drop of oil between your dog’s shoulder blades and at the base of the tail. That is important. You don’t want your precious pooch licking off any undiluted essential oil. You can also place a drop on his bandana or collar, especially when he’s out for a stroll or run in grassy areas. The shampoo trick can also be used or simply add a few drops of rose geranium oil to his final rinse water when he’s having his bath. 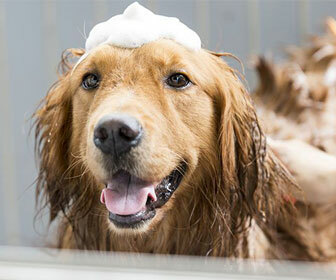 PRO TIP: When using a spray mixture, always brush or massage your dogs coat “against the grain” to get down to his skin. This will ensure you reach all the fleas that may be hiding, and get to any eggs or tiny larvae on their skin. If you want to use the best essential oil combo to kill fleas, I recommend using coconut oil, lemongrass oil, peppermint oil and water for your pooch for lighting fast results. This is by no means a complete list of oils that can help us in our fight fleas on our dogs. Some others that can make a difference and help keep your mutt from scratching itchy flea bites are cardamon oil, lemon oil, and pennyroyal oil. I’m sure that you will enjoy researching these options to see how you can add them to your collection of flea fighting weaponry. How long does a treatment last and does it keep fleas away? The truth is that commercial flea products are quick apply and in some cases very long lasting, requiring minimal effort on our part. But with that convenience, we are using toxic chemicals, which can be potentially harmful to our pets (especially in the long run). How do essential oils compare? Well, although they are very effective, they do require more work and couple reminders. Generally speaking, you will need to apply them regularly (around once per week), which some people find a little annoying. In my opinion, the benefits outweigh the negatives. As for keeping fleas away, the oils do that very well (sometimes even better than commercial products, based on my own experience), provided they are not washed off. If you live in an area where there is a lot of rain (or your pet likes to swim a lot), do yourself a favor and make larger batches of the DIY flea spray (containing the oils) and keep them in a dark and cool place. Using these natural oils in our homes for a flea-free environment. Although some essential oils do kill on contact (cedarwood oil is an example), the reason why we would use them to combat fleas is because they detest the smell and will try and get away from it at all costs. Let’s have a look at three different options that you can use in your home, and please remember to substitute oils in the recipes based on your type of pet. Homemade carpet powder using eucalyptus oil: Make your own flea repellent carpet powder by mixing 15 drops of eucalyptus oil in 1 cup of cornstarch. Use a fork to work the oil into the powder. Sprinkle over your carpet, brush it in using a broom (not too hard though) and leave for 48 hours. After this, give your carpet a thorough vacuuming, using a regular bag based brand (to avoid clogging up the more fancy ones). Peppermint, cedarwood and vinegar water spray: I like to use cedarwood oil as it kills fleas, but the choice is yours depending on what you have available. Place 20 drops of oil into a 34oz spray bottle and fill the bottle with equal parts vinegar and water. Give it a good shake and use to spray skirting boards, curtains, pet’s bedding, and even furniture. I recommend that you repeat at least once a week. Diffuse a cocktail of oils (based on what you love): Not only will this create a lovely smelling atmosphere and have all kinds of health benefits, it also creates a very hostile environment for fleas to thrive. The key here is to mix a couple of oils that you love (get creative here, but perhaps start with lemongrass because it smells heavenly), put into a water diffuser and let it run for about 15min. Repeat throughout the day. PRO TIP: If you are going to use any oil in a diffuser in your home, you need to make sure that there is proper ventilation in the area. An animal’s sense of smell is so much sensitive than ours, and they can be easily overwhelmed by the odor. Keep windows and inter-leading doors open, and don’t run it continuously. Being an avid gardener, I love planting flea repelling plants like lavender, basil, catnip, sage and rosemary to discourage insects from taking up residence in my yard. If you don’t like the idea of looking after plants and would prefer to use the essential oil from them, the good news is that it works just as well. To achieve this goal, simply place 20 drops of peppermint oil and 20 drops of cedarwood oil into your garden hose nozzle (you can pick these up at your local garden stores for a couple of dollars). 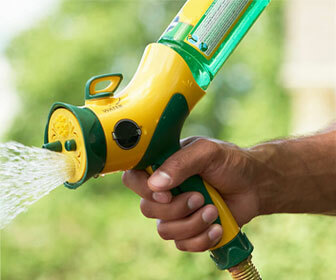 Attach this nozzle and spray away. As mentioned above, this will also keep other nasty insects away, so if you love growing veggies, do this regularly. UPDATE: Please repeat the recipe above as many times as you need to completely cover your yard, focusing on the problem areas first. Additionally,if you are looking for another good solution for killing fleas your yard, please check out my other guide that covers beneficial nematodes (they are amazing). So there you have it – you are definitely spoilt for choice when it comes to finding the right essential oil for the right job! With such an extensive range of essential oils available to do battle with those persistent fleas, I do not doubt that you will come out victorious. With regular use, you will ensure a flea-free pet, home, and yard.